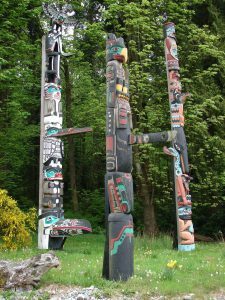 Totem poles exist in a variety of forms and for a multitude of purposes, perhaps the most notable being the house frontal pole. This pole, usually standing twenty to thirty feet tall, has the most elaborate and decorative carving and usually tells the story of the family or clan which owns them. These totems often stand at the entrance to the home of the head of a clan and are carved with “clan emblems and depictions of events, legends, and myths that recalled family history.” One such myth of ancestral beginnings is the belief that an ancestor transformed from an animal into a human, and as a result, many totem poles will depict animals that the clan either identifies with or believes to be an ancestor. Often times, the totem was believed to protect members or to serve as a symbol of the clan. House posts. Usually eight to ten feet tall and used in the interior of the home to support the roof beam. Mortuary poles. The rarest type of totem pole, they may be as tall as fifty to sixty feet. These poles incorporate a grave box which will hold the remains of the deceased. Memorial poles. These stand in front of a clan house for up to one year after a person has died. The purpose of these poles is to honor the deceased and also to identify who will be his or her successor. Memorial poles often displayed crests and figures which depicted events or achievements in the life of the deceased. Welcome pole. Usually situated at the edge of a stream or on a beach to welcome guests or intimidate strangers. Shame/ridicule pole. Used for public ridicule to embarrass groups or individuals for unpaid debts or when they do something wrong. Totem poles are just one of the many ways in which family history is spread in Native American culture. These poles all tell a unique story of one’s family and the achievements and major events in the lives of the owner’s ancestors. Each type serves a different purpose, but all are unique and tell stories which can be passed down through generations. Andrew T. Carswell, The Encyclopedia of Housing, Second Edition (Sage Publications, 2012), GoogleBooks. 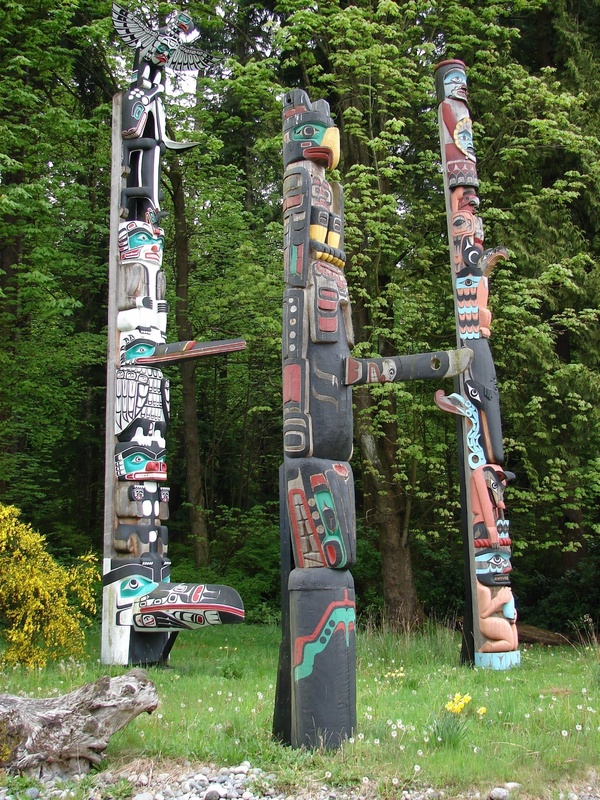 Pat Kramer, Totem Poles (Heritage House, 2008), 16, GoogleBooks. Hilary Stewart, Looking at Totem Poles (D&M Publishers, 2009), 20–21, GoogleBooks. Richard Feldman, Home Before the Raven Caws: The Mystery of a Totem Pole (Indiana Historical Society, 2015), GoogleBooks. William Marder, Indians in the Americas: The Untold Story (Book Tree, 2005), 130, GoogleBooks. Feldman, Home Before the Raven Caws. Stewart, Looking at Totem Poles, 25. Stewart, Looking at Totem Poles, 24. Fiona Reynoldson, Native Americans: The Indigenous Peoples of North America (Heinemann, 2000), 33, GoogleBooks. Thanks for this article on one of the important modes of communication in the Pacific Northwest, which appear all over. Many are reproductions, but various tribes still build them in honor of their ancestors. I would really like to learn to “read” a totem pole. Maybe that would be a secret only for tribal members, but as family history it would be fascinating. There were probably totem poles earlier than that. Stone tools are efficient and effective carving tools. I was told that the reason old totem poles didn’t exist was the simple fact that in the temperate rainforest environment in which they were created, unprotected wood disappeared pretty quickly. Having lived there, I can attest to that. And totem poles were by definition unprotected. Katherine, there are “public” totem poles that are easy to read if you know the stories they are based on, and there are books about both stories and poles. My girl scout troop learned some of these, and more when I attended The Evergreen State College in Olympia, WA, which has a marvelously rich Native American Studies program. And a totem pole carved and painted by students when I was there, to honor women. I hear there is another pole now, too. I hope I can return to see it, and participate in the annual gathering there.